The H-940 Tilting Disk Check Valve is similar to H-920 Wafer Swing Check, except the shaft is closer to valve centerline; this balances the disk so that the valve will open at a low pressure differential. Available with O-ring shaft seals to reduce friction. 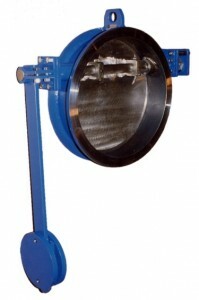 Available with wafer-style body (as shown) or with full flange with threaded bolt holes. Available with external counterweight or spring. The H-940 can be fabricated from any weldable alloy and is clearly marked to show direction of flow. Available in sizes 12″ and larger.